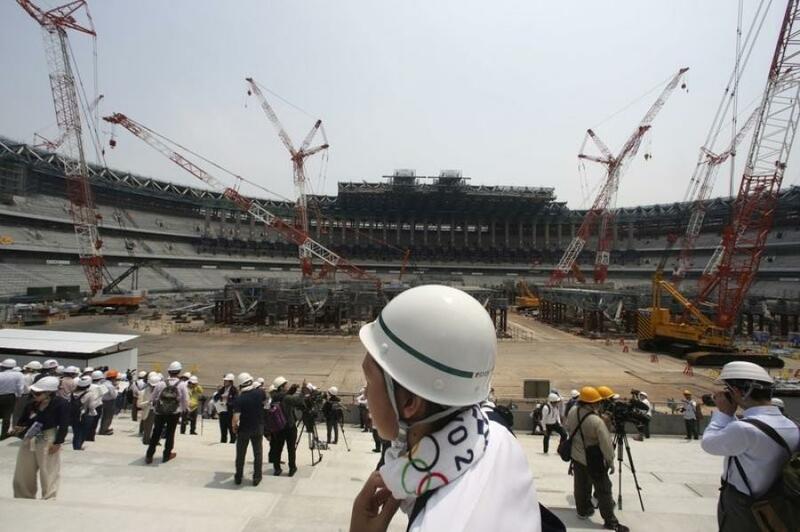 TOKYO (AP) — The Japan Sports Council gave a progress report on the new National Stadium for the 2020 Tokyo Olympics on Wednesday, saying the project is 40 percent complete with two years to go before the opening ceremony. Located in central Tokyo, the Olympic Stadium will be the centerpiece of the 2020 Games. The JSC, the government-funded stadium operator, says the 68,000-seat stadium is on schedule to be finished in November 2019. It will host the opening ceremony on July 24, 2020 as well as athletics and the closing ceremony. The construction was more than a year behind schedule when it started in December 2016, as an earlier stadium plan was scrapped because of spiraling costs and unpopular design. The Japanese government approved the new 150 billion yen ($1.5 billion) stadium which is a joint venture among Taisei Corporation, Azusa Sekkei Co. and the office of Kengo Kuma, the architect who designed the replacement. The JSC says the construction site has about 2,000 workers on an average day but that will be increased to 3,000. JSC officials say the biggest hurdle to overcome now is construction of the stadium roof, which will cover spectator seating and is considered to be the most difficult aspect of the construction. For the roof, Kuma chose a wooden lattice design which echoed traditional styles seen in Japanese shrines and pagodas. It is intended to blend in with surrounding parkland and will be structured to minimize costs for heating and cooling. Tokyo organizers said this week that all the newly-constructed venues for the games are 20 to 40 percent complete. The Olympic Village will have 21 flat-type buildings and provide 18,000 beds for the Olympics and 8,000 for the Paralympics. Organizers say its 40 percent completed and will be finished in December 2019. After the Olympics, two 50-story buildings will be developed and sold to the public as residential units. The Olympic Aquatics Center will host swimming, diving and artistic swimming. Located in the Tokyo Bay Zone, the newly-constructed four-story facility will have a seating capacity of 15,000. The facility is scheduled to be finished by February 2020. The Sea Forest Waterway will host canoe sprint and rowing events. Also located in the Tokyo Bay Zone area, the venue will be able to accommodate 24,000 spectators. A water gate and pumping facility will be set up at both ends of the 200 x 2,000-meter waterway to prevent waves and tide level from affecting the competition. It is expected to be completed in late 2019. The Musashino Forest Sports Plaza, which will host badminton and fencing, is the only completed venue and has already hosted several sports events.